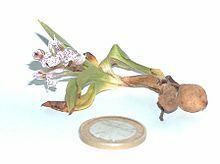 Orchis lactea with root visible. From Latin orchis, from Ancient Greek ὄρχις (órkhis, “orchid, testicle”) (ostensibly from the shape of the roots). a plant of the orchid family (Orchidaceae), bearing unusually-shaped flowers of beautiful colours. (colour) a light bluish-red, violet-red or purple colour. (colour) having a light purple colour.